"Precious Palms" is an amazing executive style home, all on one level and located in the exclusive gated community of Destiny East. The home is located on a cul de sac street in the central mix of the community for easy access to the renown pool complex and to the white sand beaches! Take a stroll to the beach or Destin's Famous Crab Trap Restaurant for a fun filled day! You have an option of renting a street legal Golf Cart to ride around the "back" streets of Destin. This property has a very open floor plan which caters to family gatherings and the Florida lifestyle of gourmet dining, indoor/outdoor living and friendly entertaining. From the comfortable furnishings to the private patio, this home will please your budget and your guests. "Precious Palms" is located within the prestigious cobble stoned community of Destin East. This development is family oriented offering a resort experience. Walk on over to ” Club Destiny”, to enjoy the expansive pool complex with cooking pavilion, huge children’s playground (adjoining the pool), clubhouse, fitness center, putting green, tennis courts, basketball, and a 25-seat enclosed movie theater where you can watch your own movies! Or take a walk along the dedicated walking trail to serene Lake Destiny. This is a newly renovated home with tons of upgrades, including new flooring, a brand new kitchen (new cabinets, granite tops and new Kitchen Aide appliances)- and new furnishings! As you enter the home, you will note the open great room floor plan with living room boasting a large TV, DVD Player and sofa sleeper, open to dining room and kitchen. Enjoy the breakfast bar with 3 bar stools. The Master Suite features a KING bed with Large Television. Master bath has split vanities and a large walk-in shower. The Guest bedroom #1 features a QUEEN bed and the third bedroom has a Trundle with Full/twin. Grill your freshly caught fish on the gas grill in the private backyard with patio eating area. 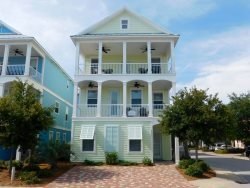 "Precious Palms" is conveniently located close to Destin Commons shopping (5 min. ), Silver Sands Outlet Mall (7 min. ), and Destin Harbor (9 min.). Unique restaurants, coffee houses, and boutique stores are less than 1 mile away…and don’t forget about the short stroll to the the incredible white sand beaches of the gulf!! Refrigerator, Stove, Microwave, Dishwasher, Coffee Maker, Toaster, Garbage Disposal, Blender, Can Opener, Mixer, Pots, Dishes, Utensils, Compactor, Counter, Wet Bar, Dining Room, Paper Products (limited), Kitchen Soaps Provided. Beach, Bike Rental, Boating, Bowling, Antique Shops, Fishing, Golf, Jet Ski, Kayaking, Horseback Riding, Miniature Golf, Para Sailing, Restaurants, Rafting, Swimming, Scuba, Snorkeling, Shopping, Water Skiing, Water Park, Walking Trails, Water Park nearby & Beach nearby! Great people and very friendly with a lot of patience for my tons of questions. Excellent experience. Property manager was very responsive from time of booking through checkout process. Very clean and comfortable. We will definitely book through this company again. LOVED Precious Palms...very clean, recently updated, good location, and the perfect size for our family. Great job Cheryl and Rick ! We had a great time at Precious Palms. Wish we could have stayed longer. The team members have been most helpful and very kind to us. The accommodation is lovely, we couldn't have picked a better place. We loved the large bathroom in the master bedroom. The bed was very comfy too! Also loved the new renovations. It was a very nice, cozy stay! Cheryl was super nice and easy to talk to. If we e-mailed or called her she got right back to us. You can see that she loves her customers. We had a wonderful week in Destin in your property. Everything was perfect. The house was super clean and gorgeous. Destin Comforts of NW Florida Inc.
To use the Beach Club you must wear the amenity bands provided in the home. if you lose one the cost is 25.00 per band please make sure the same number of bands are in the home when you leave. Community is located right across from the beach road, so go ahead and pack your things and walk on over to the beach! The main gate faces the beach road, and the back gate takes you to the main highway in Destin. You are in the middle of it all!